Although it looks very much like their brick set, this floor chisel from Stanley has an entirely different purpose. You use a floor chisel, sometimes called an electrician’s bolster, to remove flooring. The long narrow blade is designed to get between floorboards, cut through tongues, and pry up the loosened boards. Stanley makes this 11″-long chisel with a 3″-wide offset blade that they harden, quench, and temper to increase the operating life and make the tool safer. They finish it with a powder coat to protect the metal, and they fit the handle with a bi-material ergonomic hand guard to protect your hands from errant swings and absorb some of the shock of hammer blows. Next time you need to remove a floor you might want to spend the $10 to $15 for one of these chisels. The ones in our tool kits were made by DASCO – who still makes them in 2 inch wide and 3 inch wide configurations. 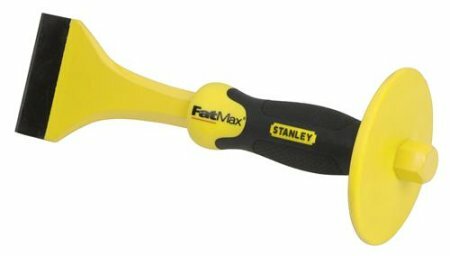 These are not as nifty or ergonomic as the Stanley Fat Max tool pictured but they still come in handy – although much less so these days since there are other power tool options for removing flooring sections. At one time – DASCO also made floor ripping chisels that sported offset blades in sizes ½ inch (# 462), ¾ inch (# 464) , 1 inch (# 466) and 1-1/4 inch (# 467). I do not believe that they still make these. Back in the day – flooring carpenters also carried hand flooring saws. We have one somewhere in the shop that was made by Goldblatt. It has a curved-up front end with teeth that allowed you to start a cut in the middle of a flooring board. For laminate floors Crain Cutter also makes a tool (their #575) to help break-out damaged planks. I pulled the guard off of mine and welded a 3′ x 7/8″ shaft onto one of these. I don’ t pry things with it, but it is good for chipping up goop (paint, plaster, poly, epoxy resin, ice, etc) from the floor without bending. The shaft isn’t as tough as the chisel, but it does a good job of transferring the energy from a hammer smack, and with the heavier shaft it works just sliding it across the floor by hand.